As he helped her up steps of the cabin, the couple began reminiscing about the many summers they had spent there. The summer afternoons when their children and grandchildren came to visit were undeniably the most treasured. Watching as they caught their first fish, floated on inner tubes and picked flowers in the field always brought a smile to their faces. As they looked out across River Bend, they imagined many generations of their family spending their summers here! at Piney Creek. Question: What is the height of the front dormers? Question: What are the dimensions of the dormers? Question: Are there posts under the balcony line? If, so how many? Thank you. Answer: Thanks so much for your interest in our design! We use a laminated beam to carry the balcony load; therefore no posts Are called out. Question: Why is there a door going from the outside into the master bedroom? W I closet on grilling porch? Is there room for a stairway going down? Answer: Thank you for your interest in our home plan designs. 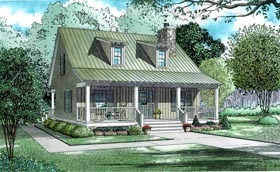 This plan like many of our others, have access to porch from master bedroom for convenience reasons only. The entry can be closed off by personal choice. The water heater/ storage closet is off the grilling porch. Also, there is a stairway already on the plan for going down stairs to a possible basement/ walk out basement foundation plan. The stairway door is adjacent to the great room fireplace and the stair way to go upstairs is near the great room window. If you have any additional questions, please feel free to ask. Question: What walls would be good for pocket doors? I believe in utilizing space with pocket doors. Utilizing all space, so as to not have dead space. Thanks for the help. Question: Can you please tell me if this plan is approved for building in New York? Thank you in advance. Answer: Our plans meet the International Building Code. Our plans do not meet your local specific codes. You will need to take the plan to a local engineer to have them make the plan meet NY codes.